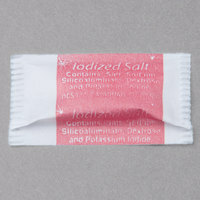 Perfectly portioned, these salt packets will deliver just the right amount of flavor to your customers' food. These .6 gram packets are ideal for any restaurant, diner, convenience store, cafeteria, or take-out station and offer a quick and easy way to complement profitable menu items. Useful for on-the-go orders, these salt packets provide sanitary packaging and an ideal portion size for improved customer satisfaction. Perfect amount of salt! The packets we received were very similar in design to the pepper, but not an issue. Great quality, very little spillage, overall great product. Very happy! The salt package is a average good amount size for our customers. We use these in the lobby, to go orders as well as drive thru orders. But for some odd reason the salt package is navy not red. I had ordered it a few times and both the salt and pepper has the same blue cover writing. IT should be red so that customers can identify it easily. Awesome product good guality and quality for the price. Item was well packed shipped fast. No customer complaints will be ordering this item again soon. Salt has a good taste. Perfect amount in each packet for the average person and they are way easier to transport compared to hauling around salt shakers to our catering events. These packets are the perfect amount of salt to add to almost anything. It would take a long time to use the box because it comes with so many packets! Very economical. These are Great little packets of salt, they are easy to open, good price and we love having them proportioned for us and ready to go. This is a low cost salt that is packaged well. This is a great proportioned size for French fries. Highly recommended for any restaurant and cafeteria. A really good portion packet of salt. It is perfect for adding a dash to your fries or meal. The salt packets come in a nice case and ship super fast. ordered these for a large pary i was having and they worked much better than having to place salt in containers, simply placed in a basked for easy access, and the portion amount was just right. This is our new salt packet, the price is great and I love that the case size is smaller than what I could get through my food service provider. The picture is not what the actual product looks like but that doesn't matter to us. Someone reviewed that it looks similar to the pepper packets and it does but we haven't had any issues yet. These salt packets were perfect at our BBQ wedding. We left them at the end of the buffet in beautiful bowls instead of buying salt and pepper shakers for each of our 24 wedding tables. More cost effective and we had tons left over. We are a non profit organization always looking for the best price and fast service! Westaurant fits our criteria. The pepper packets are the best product for the price! It's salt, and what else can I possibly say about it? It arrived well packaged and none of the packets were opened up or damaged. The package looks a bit different than what is pictured. There is no red mark down the center, instead it has the contents written outside it. Convenient packaging. Back says "have a nice day"
I really do not know you could mess up salt packets. It is what it is; nothing more, nothing less. I'm pleased with my purchase and we'll order it again in the future. A great value per packet when you take into consideration the 3000 packets you get per case. Like other reviews have said, the packets are small, but there is still plenty of salt for single use. I like them for that reason. It allows the customer to use all of the salt and you are not wasting any of it. The only downfall is about 10% of mine were "dud" packets and had no salt in them. Seriously can't beat this price for 3,000 individual packets of salt. These are perfect for lunches/picnics and to set out at cookouts or get togethers. Will def purchase again. Nice little packets of salt but they are really small. If you don't mind the size than it's not an issue, but I believe other salt packets are much bigger. Great product but the size is too small. Each one is maybe 1/4 - 1/2 teaspoon of salt which means you have to give more of them to customers. Good price and I like the 3 separate bags in the box. I noticed that there weren't any open ones in the bags so no mess, nice. This three thousand pack of salt is perfect for any restaurant Never run out of this very needed condiment when you or your customers truly need it.. These salt packets are a great price. The quantity allows me not to have to order soon. I don't have anything negative to say about them. I would highly recommend this product. Great option for single serve take out or counter service instead of a cutlery pack. We use these for things like to go hard boiled eggs or fries. Difference packaging than advertise, but not a bad quality. Came with three bags in the box. Individually wrapped. But for the price what it offered, it is worthy. Nice and cheap salt. These are the best you can buy for the price. We use these everyday at the store. If you are thinking of buying salt buy this one. The difference between the salt and pepper packets aren't to good. There is a subtle difference between the two which isn't good. We had a customer grab a salt packet instead of a pepper packet and poured it on there food. We had to remake the food. Need better labeling for the salt & pepper. A great item for the price, you get a lot of salt packets for the value. Logo of description is nice not big and bulky logo. At 3000 packets per case, these salt packets are an economical purchase, and a must have item for restaurants of all types who offer take out orders. If used in-house, these packets can save you from having to constantly fill, clean and replace salt shakers, which is a time saver, and don't we all love those? What can I say? It's a salt packet. What's great is that the price is considerably lower than our local food service supplier, even with shipping added to the price. We love these little salt packets, so much easy to deal with. No need to refill your salt shaker or keeping it clean, just a one of these is all someone needs. As with the pepper packets we ordered, the photo shown is not what was received. I'm hoping that the packaging has since been changed. The designs on the two packets were identical except for a subtle color difference on part of the text making them almost indistinguishable when placed in a caddy for customer use. I'd double check with customer service to confirm that the packaging has changed before ordering again. We appreciate your review, Michael! If you are looking for more information on the product that you are purchasing, please contact our Customer Solutions team. Affordable, and sized just right for our customers. 3000/ Case so one will last a long time. Customers can grab them and use them as needed. Convenient sized product. Great and easy for customers to grab and go, especially great for delivery orders. Would definitely order again when we run out. Super cheap and easy way to distribute salt. Much cleaner and neater than using shakers that need to get refilled and cleaned frequently. Saves time and labor. These packets are very good and they actually contain a lot of salt, more than the normal salt packet you receive from the local fast food restaurants. When you sell food to go there not a better option than control portion packs, you save money, you dont have to package it your self and no need to spend money on disposable packaging. Super cheap option to providing salt to our customers at our concession stand. I couldn't find them cheaper anywhere. Thanks Webstaurant for helping us save money. These were a great price and I would recommend you purchase them here and not at Sam's or any other club store. They were very convenient. We love these salt packets. We have already went through a box and have not had any empty ones and they seem to have more salt in them than a lot of the other brands. Great small packets of salt! Good for on the go uses or for to go meals! Great for picnic events! Good price for lots of packets! Nice portion size!! This is the best deal ever. There is no other places on the web or market place having this kind of price. I would definitely buy more and also recommend to all friends and family. We've gotta have salt and pepper in our breakroom, and this is the best price that I've seen anywhere for them. Can't beat it for the convenience. These salt packets are just like the old-fashioned salt packets you'd expect from a drive-in or car hop. The salt is great and the price is even better! Thanks, Webstaurant Store for offering great products! Excellent amount in portion control! Enough salt for a sandwich & a side! Perfect to include with your "to go" orders or boxed lunches! Highly recommended! The salt portion packets that we ordered were a lifesaver. They saved us room, they were convenient, and we did not have to keep refilling the salt shaker and washing out the salt shakers and caps. Also if it was damp out, or raining and hot out, the packets did not clump up, as our salt shakers did, so with these packets no longer did we have to dump out the salt shakers and refil them. We saved money, time, space, and work. Excellant product, excellant price! M. Wards Sausage and Texas Hots.